Consider a single phase line consisting of two parallel conductors. These conductors are forming a rectangular loop of one turn. These conductors are solid conductors of radius r1 and r2 respectively. One conductor is forming a return circuit for the other. The two conductors are carrying currents I1 and I2 respectively. Here we are neglecting the effect of earth's presence of magnetic field geometry as earth's relative permeability is same as that of air and its conductivity is relatively small. The arrangement of the conductors and variation of flux density due to each conductor is shown in the Fig. 1 and Fig. 2 respcetively. In the beginning, let us consider only the flux linkages of the circuit caused by the current in conductor 1. The flux line set up by the current flowing in conductor 1 at a distance equal to or greater than D+ r2 from the centre of conductor 1 does not link the circuit and hence is not responsible for inducing and voltage in the circuit. This is because conductor 2 carries current which is equal and opposite to that in conductor 1. The external flux from r1 to D - r2 links all the current I1 in conductor 1. Over the surface of conductor 2 i.e. between (D - r2) and (D + r2), the external flux links a current whose magnitude is progressively reduces from I1 to zero because of negative current in conductor 2. The total inductance of the current carrying in conductor 1 can be calculated by assuming that D is much greater than r1 and r2. Under this condition it can be assumed that flux from (D - r2) to the centre of conductor 2 links I1 current and flux from the centre of conductor 2 to (D + r2) links zero current. 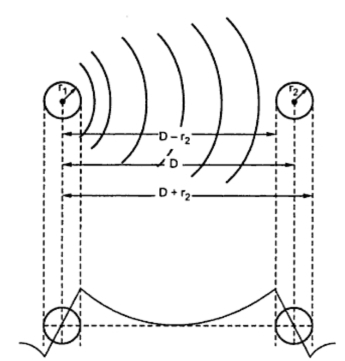 The radius r1' is that of an imaginary or fictitious conductor assumed to have no internal flux. The quantity ε-1/4 equals to 0.7778. The value of inductance given by equation (2) is same as that given by equation (1). The difference is that equation (2) omits the term on account of internal flux. But it is compensated by adjusted value of radius of conductor. The above equation is derived by considering solid round conductors. Equation II is algebraic manipulation of equation (1). Hence the multiplying factor of 0.7778 is applicable only to solid round conductors in order to account for internal flux. The conductor 2 carries current in opposite direction to that in conductor 1. The flux linkages produced by current in conductor 2 considered alone are in the same direction as those produced by current in conductor 1. The resultant flux for the two conductors is determined by sum of mmfs of the two conductors. If permeability is assumed to be constant then the flux linkages and inductances of the two conductors calculated separately may be added. The above equation gives the inductance of two wire single phase line taking into consideration the flux linkages caused by current in both the conductors. The value of inductance obtained is the inductance per loop meter or per loop mile. The inductance given by equation (2) is one half of the total inductance of single phase line and is called inductance per conductor.